M&R products have also won numerous awards. Most prominent among them are SGIA's Product-of-the-Year Awards. 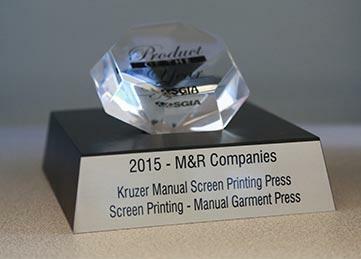 In 2014—the first year it entered the competition—M&R won SGIA's Pre-Press Product-of-the-Year Award. In 2015, M&R entered four products—and came away with four awards. In 2016, M&R received three more Product-of-the-Year Awards. And in 2017, M&R received Product-of-the-Year Awards for the groundbreaking Challenger III and i-Image S.
Of these awards, M&R Founder Rich Hoffman said, "Customer service, innovative design, and quality products form the foundation M&R was built on, and it's extremely gratifying to have two of our products recognized for their innovation and quality. Our factory technicians are obsessed with manufacturing the highest quality presses in the industry, and our engineers and the other members of our research and development department are engaged in an ongoing effort to find ways to help garment decorators work more quickly, more productively, and more profitably. And we'll continue those efforts in the years ahead."